Warning: post overloaded with photos. 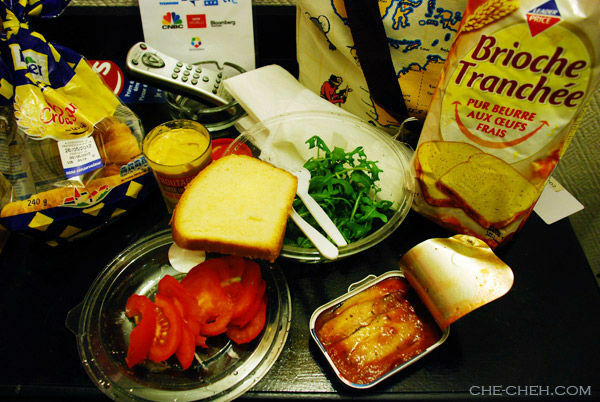 Breakfast this morning is again ‘homemade’; croissant, brioche, sardines, rocket leaves, tomatoes and mustard. We packed extra brioche for our lunch today as we will be spending half day in Versailles, a city about 20km from Paris. Took the 8am RER C train and reached Versailles a little over 9am. 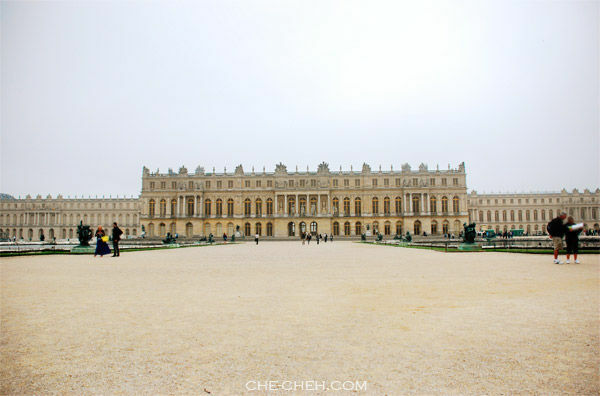 Then it was a 10-15 minutes walk to Château de Versailles (Palace of Versailles). 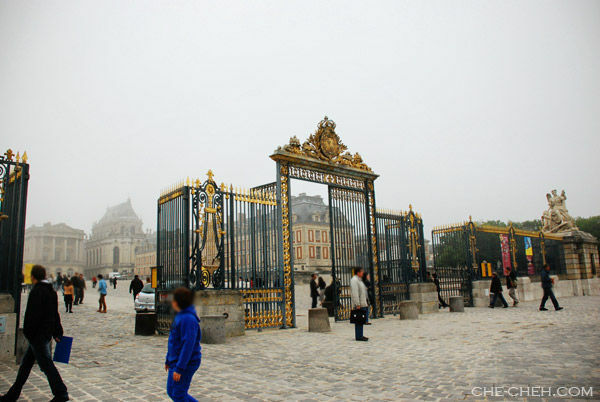 This is the palace gate to Château de Versailles, home of King of France; Louis XIV aka Louis the Great. The road leading up to the palace. As you can see it was a very foggy morning. We bought our admission ticket online before the official trip. 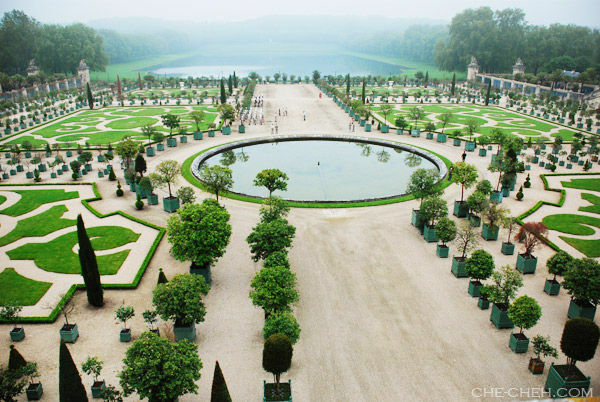 Ticket cost €15 per person for admission to the palace and garden only. 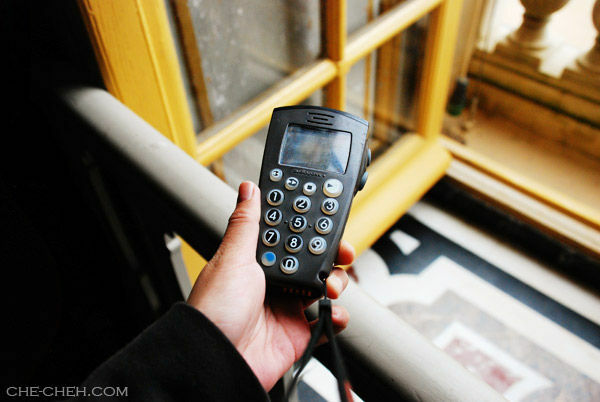 What’s cool is that you get audio guide FOC. Visit early in the morning to avoid long queue. But this… this is just something else. 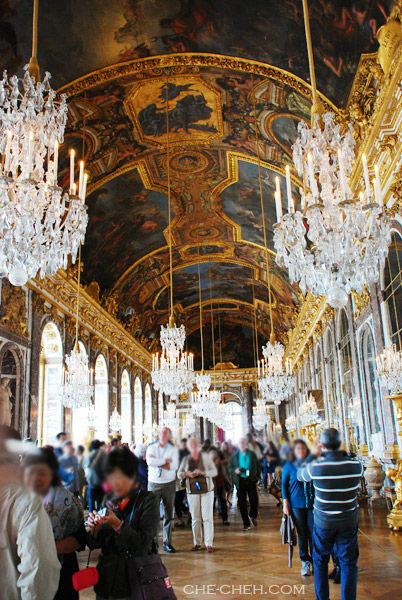 This room is called the Hall of Mirrors – the most celebrated room in the château and the world. 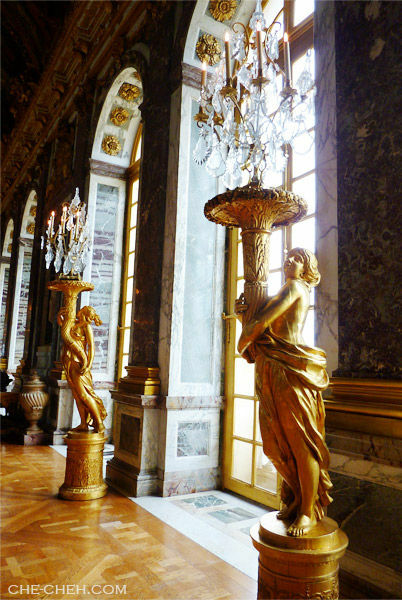 As the name suggested, this hall is decorated with mirrors, beautiful glass chandeliers and gold statues. 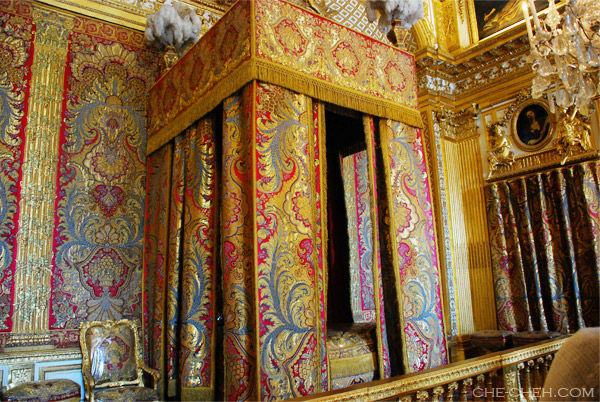 King’s chamber @ Château de Versailles. 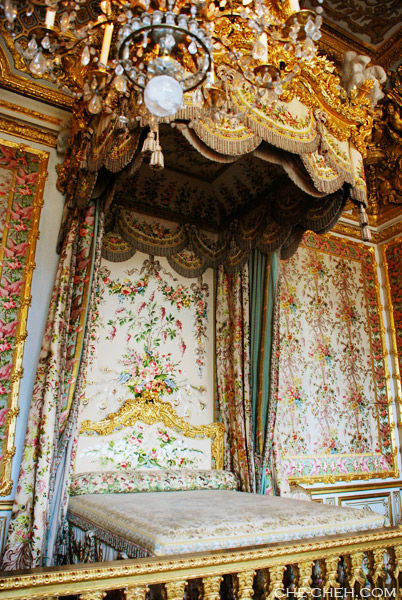 Queen’s chamber @ Château de Versailles. 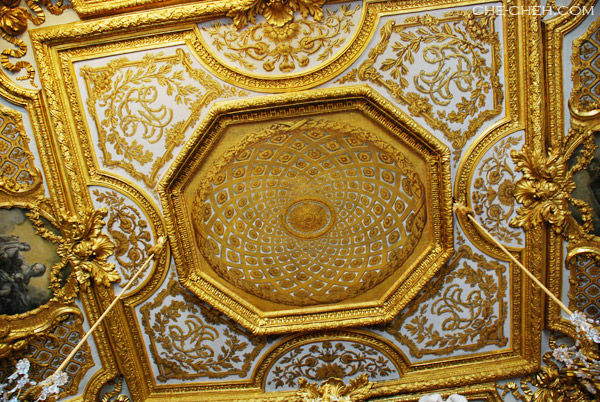 Beautiful ornamental ceiling at the queen’s chamber. 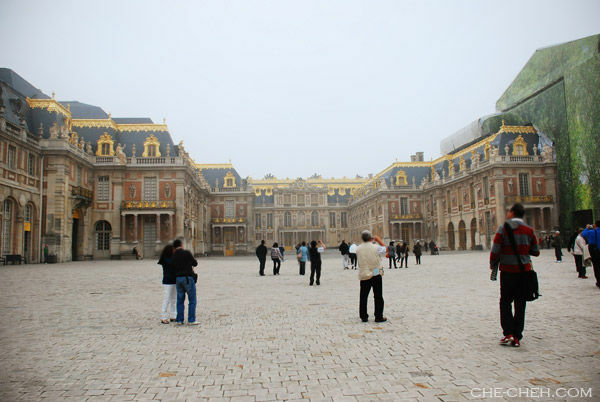 Although the palace is huge, only a few rooms are open to public. Next we head to the garden. 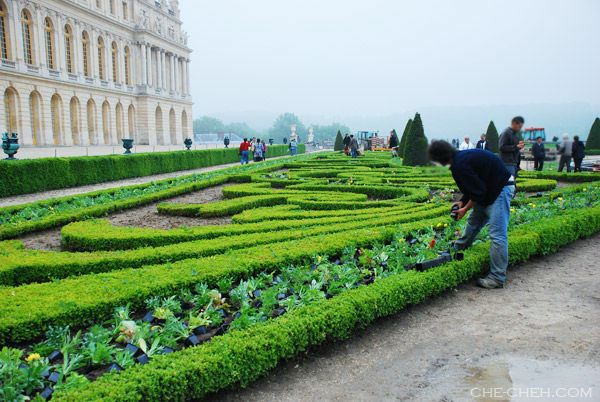 Gardeners planting flowers. I think they use cow dung for fertilizer as it was really smelly! Great view ya? I bet the walk to the fountain will be a very pleasant one. Latona Fountain and The Grand Canal in the background (mimicking the Grand Canal of Venice). We had lunch here on the marble bench. Lunch is packed sardines brioche and apples. The Royal Walk and again The Grand Canal. It was a lovely walk down to the Grand Canal. But the walk back up is tiring as you can see the ground is not level. Grove Of Girandole. 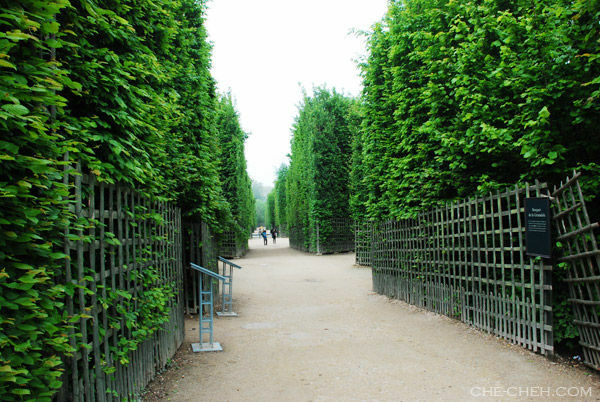 Love the tall green trees… it’s like walking in a maze. Château de Versailles seen from the garden. What a view ya? 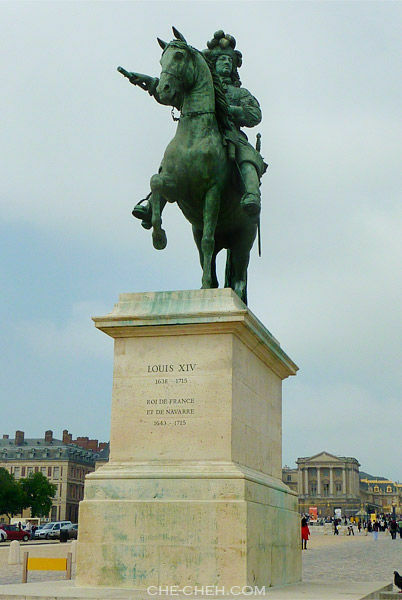 King Louis XIV statue at the front of the palace gate. We took the RER C train back to Paris at 1pm. 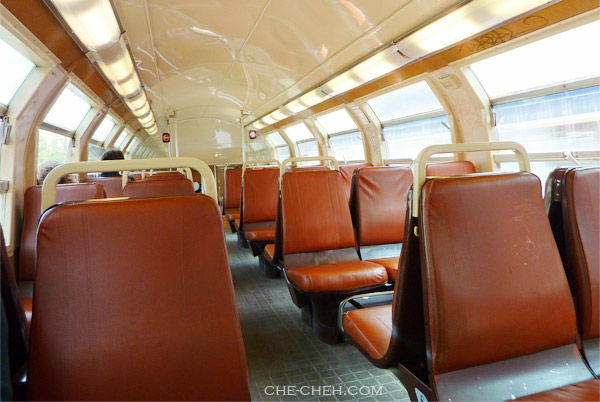 This train is a bit old as you can see (with no air-cond). The RER C train which we took to and fro Versailles has 2 levels. This picture is showing the 2nd level seating. We disembarked at Les Halles stop and proceed on a kitcheware hunt! Read my experience and what I bought here. Had almond croissant and fougasses (focaccia) – total €5.30 for late lunch at Boulangerie Colin. Yum! 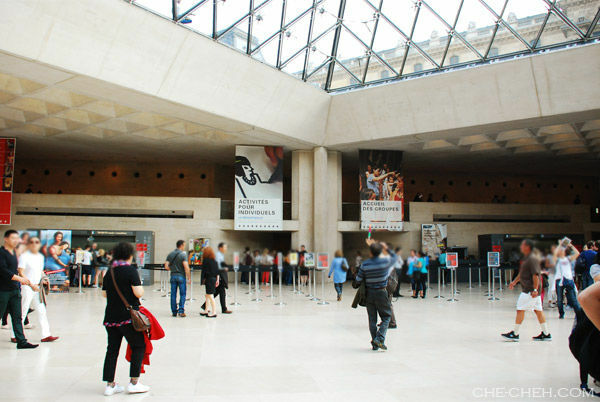 After that we went back the hotel to drop off our shopping stuff before heading out again to Musée du Louvre. 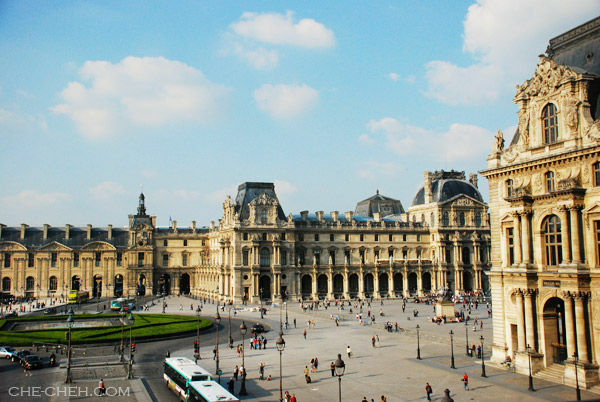 Took Metro to Palais-Royal-Musée du Louvre stop and entered through Rue de Rivoli entrance to Galerie du Carrousel and on to Louvre Museum. 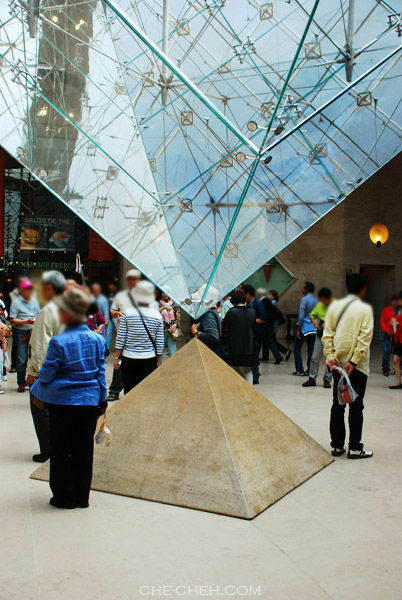 The famous inverted pyramid @ Carrousel du Louvre. We wanted to take photo with it but as you can see there are so many people there. 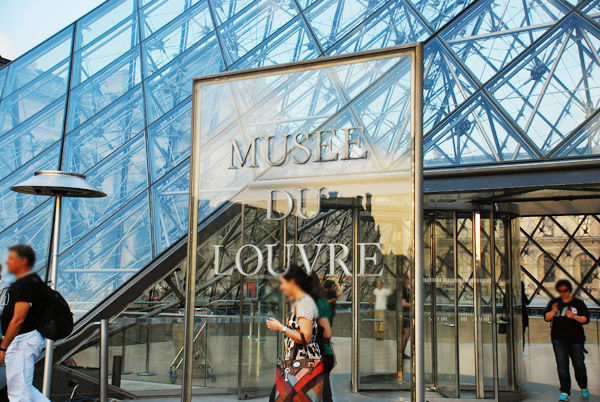 As it was a Wednesday, Louvre Museum is open until 9.45pm. We purposely choose to visit in the evening as we read the queue will be shorter. True enough queue to buying ticket is very short. 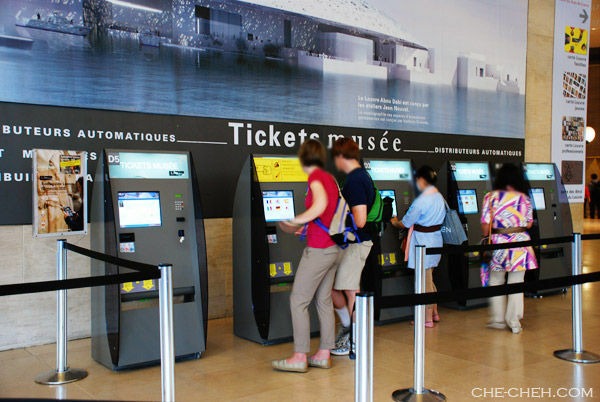 However we choose to buy our ticket from the ticket machine. The time is 5.35pm. 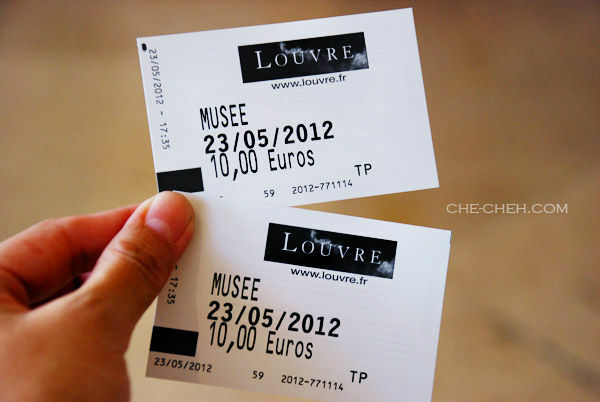 Our Musée du Louvre tickets @ €10 per person. 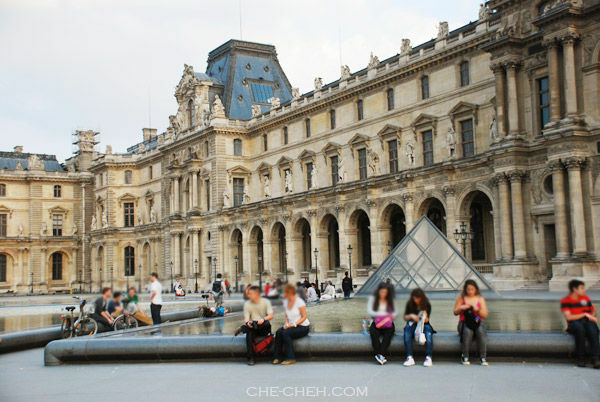 I was super excited as Louvre is one of the places I’ve dreamed of visiting. 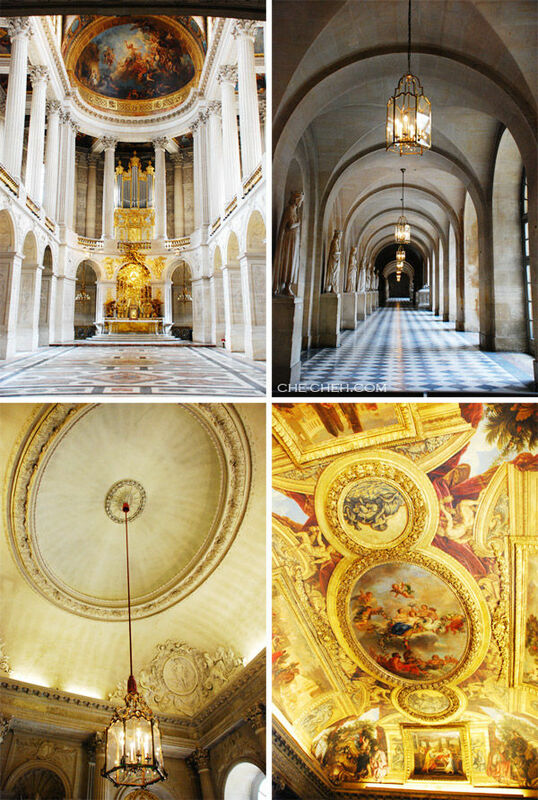 Painted and ornamental ceiling @ Musée du Louvre. The famous Venus de Milo statue. She is the Greek Goddess of Love and Beauty – Aphrodite. 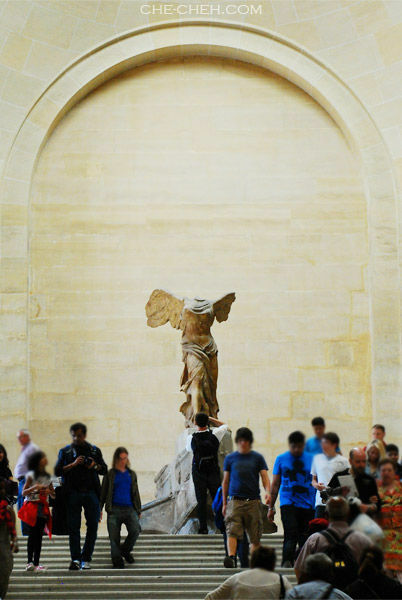 One of my favorite pieces in the whole of Louvre; Nike of Samothrace (The Winged Victory of Samothrace). She is the Greek Goddess Nike – Victory. 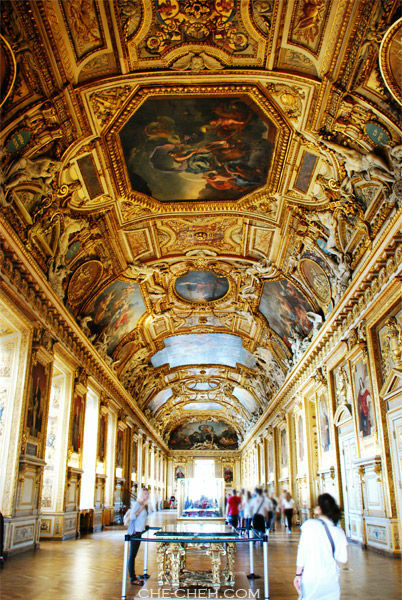 The Apollo Gallery which houses the French imperial and royal jewels and ceremonial dishes. Love this room! Louvre Pyramid and Louvre Palace seen from the window in the museum. Can you see a square in the middle of the round green field on the left? That’s where the inverted pyramid is located. Just look at the painted and ornamental ceiling. Equally impressive! More paintings. I like this room a lot. 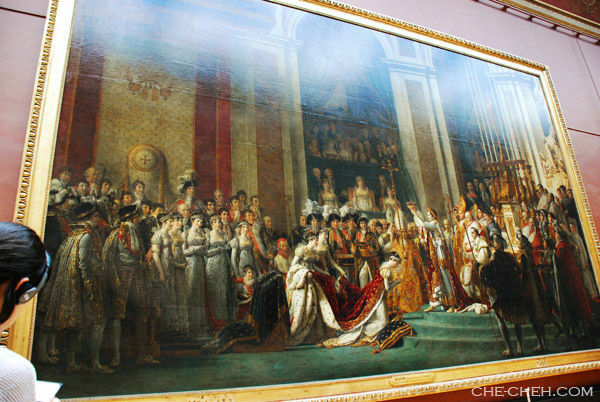 The Consecration of the Emperor Napoleon and the Coronation of Empress Joséphine by Jacques Louis David. Now this is my favorite painting. 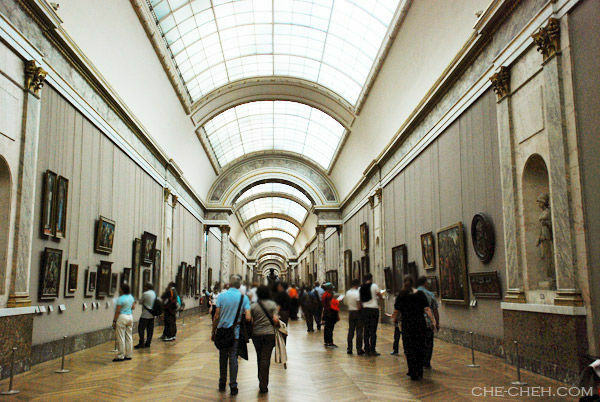 Frankly I’m disappointed at the Louvre Museum. I didn’t really enjoy my time here. 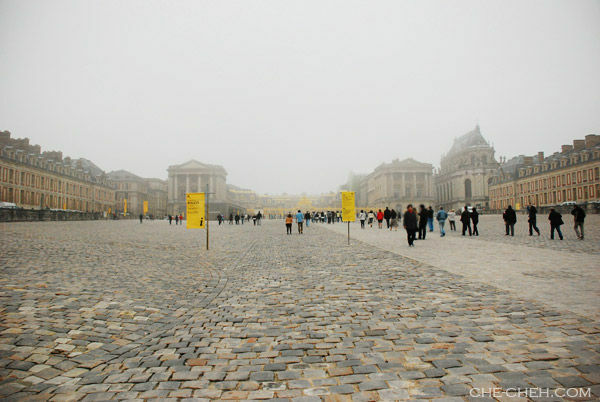 One of the main reason is because the details of the statues, artifacts, arts, etc… everything is written in French. I thought at least they would have English as the second language seeing this museum is visited by millions of tourist. So can you imagined how many times I yawned? I even yawned at the Venus de Milo statue! Personally I love the British Museum more than the Louvre. 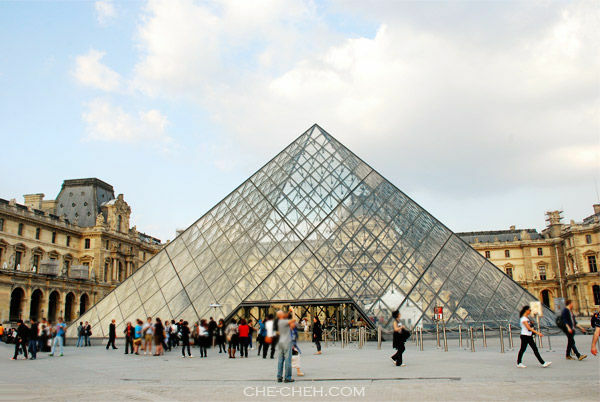 This is the pyramid main entrance to Louvre Museum. 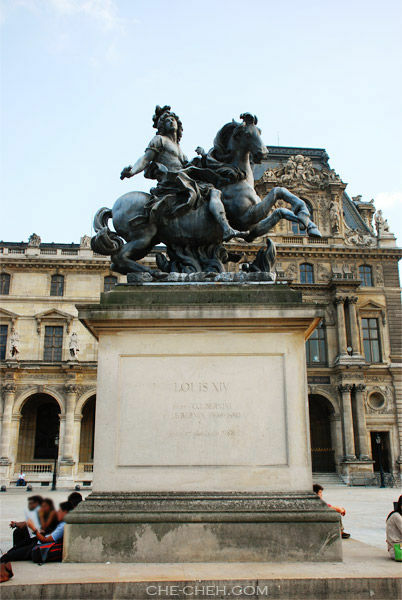 King Louis XIV statue in front of the Louvre Museum. 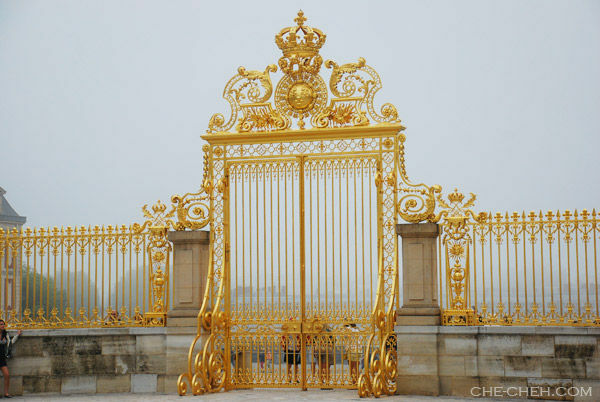 Remember there’s another statue of Louis XIV earlier at Château de Versailles? This king is so famous eh? He’s in fact the longest reigning king in European history. 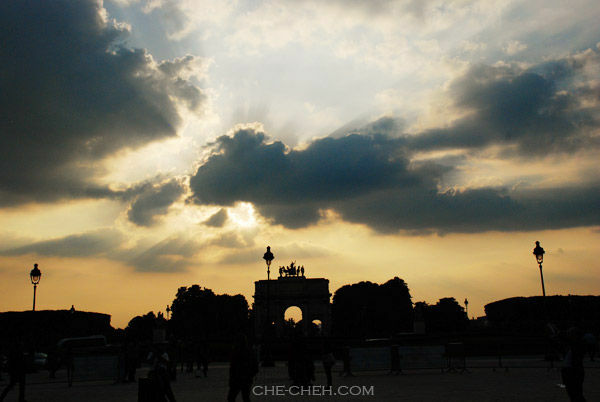 Silhouette of Arc de Triomphe du Carrousel and beautiful crepuscular rays. 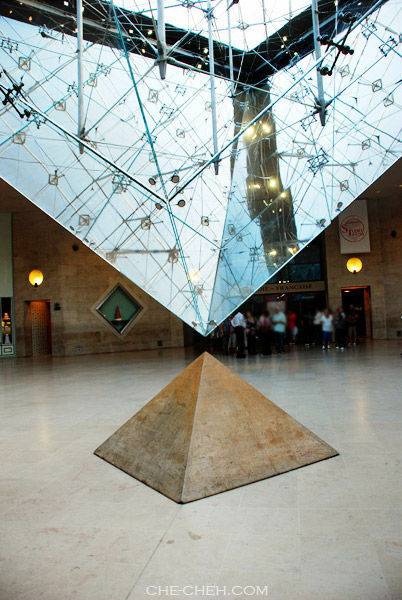 We head back inside to Carrousel du Louvre to snap this picture of inverted pyramid. Since it was late the underground gate to the Palais-Royal-Musée du Louvre Metro has closed, so we use another gate to get to the Metro. On the way back again we dropped by Monoprix to buy our dinner and top up our food for the next day. I wanna go to Paris now!!! LOL! Both palaces are stunning. I guess you have to be there to really see the difference! Oh yeah, I remember my mom told me the Mona Lisa painting is not a big deal – thanks to the media! 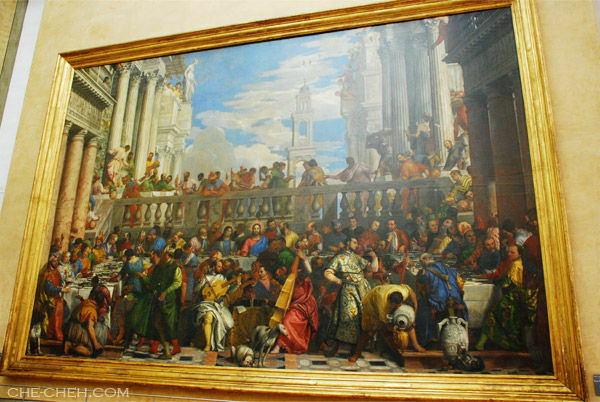 The painting of Wedding at Cana is beautiful. Me too! I miss Paris. The palace looks beautiful! So spacious outside! Nice Louvre Pyramid! Love the structure. 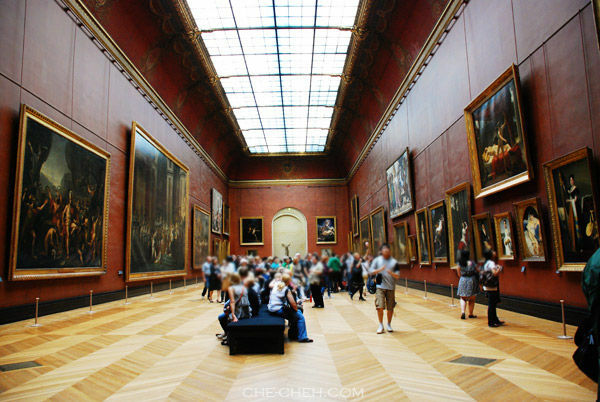 Oh, you saw Mona Lisa painting too. Overrated perhaps? The museum interior is nice! LOL yawning at the statue? I guess the French are too damn proud of their language that they refuse to put up English there? Yes totally overrated. Heh and yes maybe they are too proud of their language. Who knows. 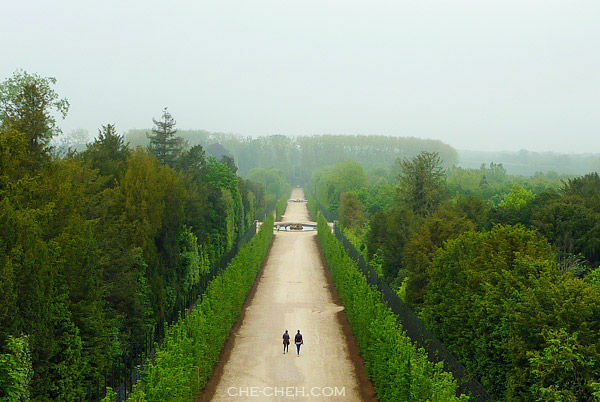 I like the garden and the greenery along the road leading to the fountain at Château de Versailles. The setting is so tranquil and peaceful! What? 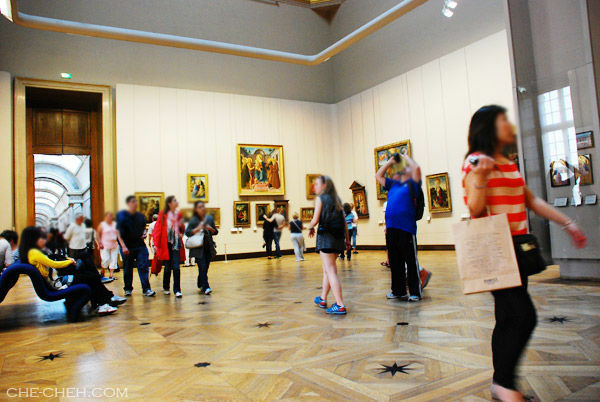 The Mona Lisa painting is small? Anyway, at least you can tell others that you have seen the painting. wow. the home of king is really berry posh and glamorous! 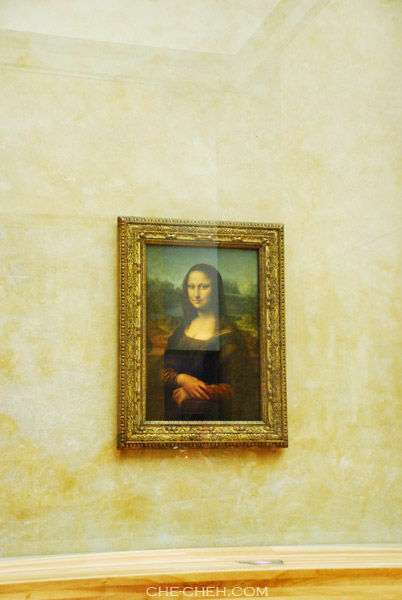 i learnt that the painting of mona lisa, is actually him himself in the paint with long tresses? I think not. Till today no one know who in that painting is and I guess the truth will be hidden forever unless someone can time travel back in time.